Water Conservation! Tired of wasting water and money? Install a Rain/Freeze sensor. With the Hunter wireless Rain/Freeze sensor you will be able to set your timer to come on automatically without having to worry about turning the system off yourself. Perfect for the early morning watering or if your going out of town. In the winter your landscaping still needs water. This device will not allow your system to operate in temperatures 37 degrees or below. Preventing an iced over landscape. The Hunter wireless Rain/Freeze sensor is wireless up to 800 feet and comes with a 5 year manufacturers warranty. 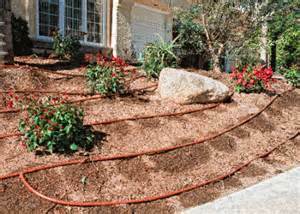 Installing drip line in flowerbeds and gardens can be very beneficial. Distribute the water directly towards the roots. Prevent wasted and unwanted water on the foliage that can result in diseased plants. Our goal is to conserve water. Both of these products will help with this mission. Call today and let’s work together to conserve Texas water.